This chandelier is accompanied by a 7' chain and matching canopy. Decorative chandelier pole as seen in photo may be purchased separately. The Grenoble Chandelier would not be complete without its black gold-lined shades! The gold lining on the inside of the shades help balance the gold dangles that adorn the arms. 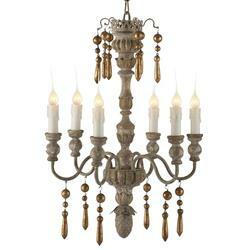 Chipped Creams found along the hand-carved center pole glow warmly when this chandelier is lit. If black is not your color of choice, we've included a set of linen shades for you as well.